Jim Mallinder has confirmed Courtney Lawes will have ankle surgery on Monday, with the England lock set to miss the start of the Six Nations. Lawes has been sidelined since suffering an injury in the win over Leicester at Franklin’s Gardens on December 20. He was once again absent as Saints claimed a crucial 20-9 Champions Cup win at Ospreys on Sunday evening. And after the game, Mallinder gave an update on Lawes’ situation with the news not good for club or country. “Courtney’s unfortunately not recovered from his ankle injury,” said the Saints boss. “He’ll be going in for an operation on Monday. “He’s got a bit of bone that needs clearing out so he’ll miss the first few weeks of the Six Nations as well as next week. 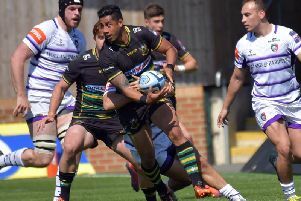 Saints face Racing Metro in a winner-takes-all Champions Cup clash at the Gardens next Saturday, while England start their Six Nations campaign at Wales on February 6.